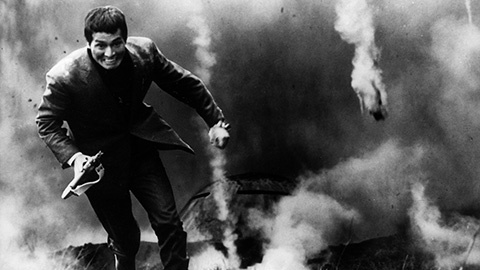 Kihachi Okamoto was no longer a fledgling B-movie helmer when he made the little-seen (and long overlooked) Epoch of Murder Madness (aka The Age of Assassins) in 1966 (released in 1967); the talented director was forty-three years of age and making his twentieth film at Toho for producers viewing him as "unpredictable", due to films like The Elegant Life of Mr. Everyman (Eburimanshi no Yuga na Seikatsu, 1963) and Oh! Bomb (Aa Bakudan, 1964). Inevitably, Kihachi Okamoto’s taste for black humour with experimental, surreal and absurdist tinges placed him under close scrutiny from his Toho supervisors, which should have meant keeping a low profile and following studio rules. 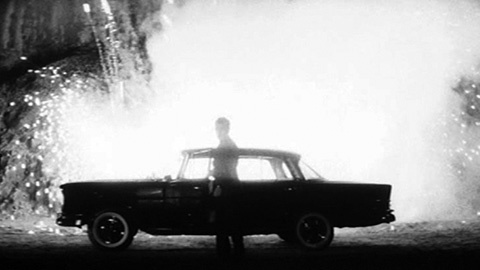 The leopard, however, would not change its spots, and Okamoto decided that he would not do Epoch of Murder Madness "the safe and cautious way", turning this project with an already mad title into his zaniest film ever, mixing all the flavours of a typical Okamoto narrative into his distinctive brand of postmodernism and noirish nihilism, with bouts of tautly choreographed action. 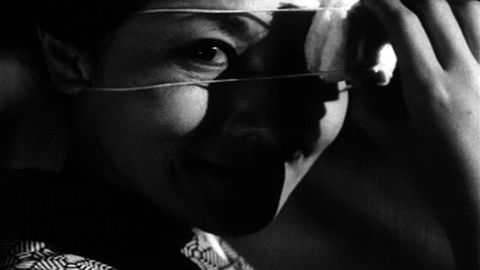 Epoch of Murder Madness had originally been a Nikkatsu project and was bought up by Toho. In the serialized novel (known as Namekuji ni Kiitemiro and Ueta Isan) by Michio Tsuzuki, a young man named Shinji Kikyo is bent on killing twelve assassins trained by his father, a criminal mastermind once lauded by Hitler himself! By killing the twelve disciples, Kikyo aims to atone for his father’s crimes. However, this expiatory mission is not without its hazards, as the young man knows nothing about the names, faces or distinctive killing styles of the disciples. Michio Tsuzuki’s novel is divided into twelve chapters, one for each killer. What sounded like "The Twelve Labours of Herculean Killer Shinji" evolved into a dark, surreal comedy about a mad, ex-Nazi scientist running an asylum and using his male and female patients as killers in order to rid society of unproductive people, including Nakadai’s lunatic, nerdy character. Toho producers Tomoyuki Tanaka and Kenichiro Tsunoda had decided that Okamoto would not be allowed to meddle with the first version of the script, masterminded by Ei Ogawa and Tadaaki Yamazaki under the Nikkatsu banner. However, Okamoto did manage to barter a minor change into the script, turning Nakadai’s character into a not-so-cool killer, prone to do away with his opponents seemingly inadvertently. 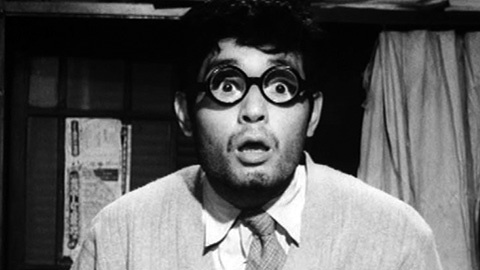 This "minor" alteration proved to be instrumental in turning the film into mainly a vehicle for Nakadai’s hitherto undercapitalized comedic talent, leading the actor to stress in interviews that playing this character was like acting out his true self, and thanking Okamoto for giving him the opportunity to shed, for once, the dark image of his samurai epics. The vision of a goggle-wearing, geeky Nakadai driving a wrecked Citroen 2CV and doing away with a bunch of weird killers in a nerdy fashion, is indeed a great departure from darker roles like Kaji in The Human Condition or Hanshiro Tsugumo in Harakiri. Eventually, his character in Epoch of Murder Madness echoes Jerry Lewis’s transformation in The Nutty Professor, as Kikyo sheds his goggles to evolve into a ruthless, super killer spy. However, what works fine as a comedy concept for a James Bond spoof fails to make for an engaging or gripping film. The loose, erratic narrative thriving on weird compositions, situations, characters and gags is often too sardonically self-conscious for its own sake, seemingly bent on forcing laughs on what could have been an equally stylish but maybe more deeply thought-provoking thriller, with a better developed commentary on what and who is considered productive and unproductive in capitalist consumer societies. Even though the shoot went smoothly by all accounts, Toho producers and writer Ei Ogawa all hated the film. Much to Okamoto’s chagrin, Ogawa slated the film by commenting that it was "not even up to standard". Epoch of Murder Madness was hence withheld for seven months by Toho, and only the support of critics like Nobuhiko Kobayashi (a.k.a. writer Yumihiko Nakahara) allowed Epoch of Murder Madness to receive a limited theatrical release, but the utter lack of publicity made the film a record box-office bomb for Toho. What remains fifty years later is an episodic, uneven gag-and-murder fest with a convoluted script (about a diamond stolen from the Nazis) and a great cast gleefully hamming it up (including the distinctive Eisei, a.k.a. 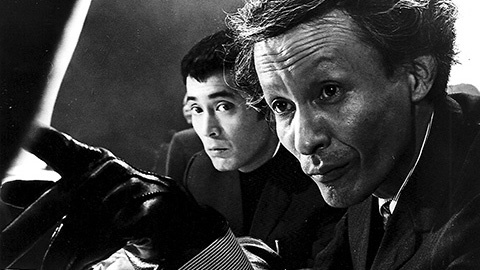 Hideyo, Amamoto, also seen as a killer in Hideo Gosha’s Cash Calls Hell / Gohiki no Shinshi the same year). The bombardment scene towards the end is indeed a great testimony to Okamoto’s talent for orchestrating chaos and mayhem with style. But his endeavour to generate comedy out of dark and weird situations cannot beat good old gags, as evidenced during a 2013 screening of the film at the House of Japanese Culture in Paris, hosting a retrospective of Tatsuya Nakadai’s films. The one gag in the movie that had the audience in the aisles was the climax of the fight between Nakadai’s sidekick (Hideo Sunazuka) and a lethal, leather-clad female hypnotist played by Atsuko Kawaguchi; upon realizing that the young man is actually less in awe of her powers than her underwear, this female killer loses her balance and falls screaming to her death. Though this gag doesn’t encapsulate the complex, equally ferocious and fragile quality of Okamoto’s film, it does prove that even mod avant-garde comedies cannot dispense with the sure bet of the broad, under-the-belt slapstick gag. This is but one of the few mainstream elements of a film that feels both productive and unproductive in its delivery of comedy and drama, puzzling and provoking in its familiar depiction of a universally deranged world.